There was an interesting interview with Alan Greenspan on FOX Business Network about housing, gold, and the lack of need for a central bank. Click the above link to see the video. Greenspan is blaming the decline of the Soviet Union and the end of the cold war for worldwide housing bubbles. "It was a geopolitical switch in which market capitalism very quietly overtook central planning and that created substantial booms throughout the world ... creating an excess of savings which drove down long term interest rates virtually everywhere. And virtually everywhere it sprouted a housing bubble." In essence, he wants us to believe that housing skyrocketed 20+ years after the fall of the Soviet Union in some sort of delayed reaction and it was just by coincidence after the Fed slashed rates to 1%. Clearly Greenspan is clearly attempting to absolve himself of his role in the housing bubble. "Central banks gradually began to lose the power of affecting longer term rates as we demonstrated rater conclusively in 2004 when we raised short term rates very rapidly and ended up with no increase whatsoever in long term, rates and indeed it stayed that way in 2005 as we continued to tighten." Greenspan has selective memory. The Fed did not raise rates rapidly as this Testimony of Chairman Alan Greenspan on July 20, 2004 shows. In May, the FOMC believed that policy accommodation needed to be removed and that removal could be accomplished at a pace that is likely to be measured. At our meeting last month, the FOMC raised the target federal funds rate from 1 percent to 1-1/4 percent, and the discount rate was raised commensurately. Policymakers reiterated that, based on our current outlook, the removal of accommodation would likely proceed at a measured pace. And Greenspan kept the "measured" pace at 1/4 point per meeting for 17 consecutive meetings. It was perfectly measured, and certainly not the "very rapid rise" he talked about in the interview. ".... what that demonstrated pretty much around the world is that central banks no longer have the capacity to significantly impact longer term rates, and it's the longer term rates that create bubbles." The rebuttal to this nonsense is that by lowering interest rates to 1%, all sorts of speculative lending took place based on the spread between banks ability to borrow at 1% and lend at a higher multiple. It is highly unlikely the market would have lowered short term rates to 1% or kept them there for long if it did. Greenspan is either being disingenuous or he is a complete fool to put forth this set of arguments on the housing bubble. Fox News: "So why do we need a central bank?" 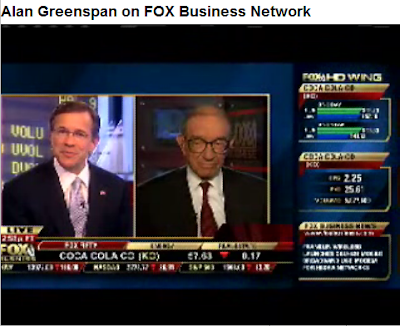 Greenspan: "Well the question is a very interesting one. We have at this particular stage a fiat money which is essentially money printed by a government and it's usually the central bank which is authorized to do so. Some mechanism has got to be in place that restricts the amount of money which is produced, either a gold standard or currency board or something of that nature because unless you do that, all of history suggests that inflation will take hold with very deleterious effects on economic activity. ... There are numbers of us, myself included, who strongly believe that we did very well in the 1870-1914 period with an international gold standard". Fox News: "We did well without the Federal Reserve. People forget that." Yes they do. And that last paragraph was one of the few things Greenspan ever said that makes any sense.